This 5-storeyed Korona Hotel has 450 beds in double rooms. Each room has two twin beds and two additional ones for kids, a minibar, a TV-set, a radio, central air-conditioning, bathrooms with shower cabins. Two lifts. The hotel aslo features a restaurant area with 320 seats, a lobby bar, 2 lifts - one panoramic, souvenir shops, a SPA centre, a fitness hall, hairdresser's, swimming pool with sunbeds and a pool bar. Came back yesterday from a fantastic week in Korona. Must recommend this lovely hotel.All the staff were really friendly. In UK this is a £100 a night job. We stayed again at The Korona Hotel Jun/Jul this year...It is still as good as we remembered..a very high standard of cleanliness but unfortunately the most uncomfortable poolside sun loungers I have ever experienced..The breakfast was good..Restaurants in Sunny Beach are mostly good and offer good value.we have been going to Sunny Beach for 6 years now and absolutely love the place.The Corner Pub has a great karaoke and atmosphere but if you really want to party try Bar Mexico..Head for The Bombay Grill for superb Indian food,and to The Neptune Beach Bar/Restaurant for great music/hospitality.Without doubt the best restaurant in Sunny Beach is The Star Inn this is near The Rila/Vitosha hotels and is well worth a visit. Please send me the prices and all kind of detailed information about this hotel. I'm interested also for rooms for 4 persons. We are going to Sunny Beach in the end of July or begining of August. please send you tel.number to me, i need it for the family in our time in your hotel. We have stayed in the Korona in 2005 and 2006 and have nothing bad to say at all. In fact were going back in August this year and realy looking forward to it. The location of the hotel is perfect, not too quiet and not too busy, in easy reach of bars, restraunts shops and the beach. The staff are very friendly and the hotel is very clean in fact some staff were there from the previous year. You don't have to go in the centre of sunny beach as everything is on your doorstep and theres some lovely restraunts close by and very cheap. The Lotus which is just round the corner is a good place to eat and they do a lovely Sunday lunch with yorkshires and theres a lovely fish restraunt were the waiters a dressed as sailors the food is good there too. There are also some nice restraunts in Nessebar overlooking the water. Food and drink are very cheap and the people are friendly.We would recommend it to anyone no matter what age group. Hi, im staying in the hotel Korona next July with a group of mates and was wondering how far it is from all the nightclubs or the center of sunny beach?would we have to get a taxi or walk? We have just returned from our second holiday to Bulgaria and the Korona. I had read some reviews before we went and wondered if the hotel had change drastically. Not so. We were glad we stayed at the Korona again and would not hesitate to recommend it. The staff were all very friendly and the whole hotel is kept very clean. We had fresh towels every day and bed linen was changed frequently. The pool area was kept clean and the pool itself was clean, although the water was so cold it was very uncomfortable to go into. The breakfast choice was very good, and everything was fresh and replenished continually. No ‘English Breakfast’, but we were in Bulgaria! People have complained about lack of entertainment or things to keep the kids happy – this was what attracted us to The Korona in the first place. But if you are looking for continual entertainment there is no shortage of hotels/bars/restaurants/clubs either nearby or in the centre. Sunny Beach has changed quite a lot in the two years since we were last there. There are more hotels – some look very nice, the shops seem to be selling better quality and a wider range of things, but the centre/sea front definitely has more of a Blackpool feel to it. Unfortunately they are still exploiting animals. Nessebar Old Town is worth a visit – much the same shopping but take time to look at the surroundings – an amazing mix of buildings. There are lots of good place to eat – The White House, just round from the Korona is bright and airy with good food. Blue and White is unassuming with friendly staff and tasty food. The Fenix restaurant was new this trip and the staff were all very helpful even warning us that both the dishes we asked for were enough for two people, not all eating places were the same. Billy’s is worth a visit If you like ice cream, don’t miss The Ice Cream Saloon in Nessebar - immediately on the right as you enter the gate to Old Town. At the other side of the main road away from the beach had a lot more shops this time we also saw a restaurant in that area where there was a queue to get a seat – so must be worth a try. We only found it on our second last night and did not have time to give it a try. We had very good weather. It was windy quite a few days that made it feel slightly cooler but not enough to keep us away from the beach or poolside. Overall, we cannot fault the Korona and unless you want to be right in the middle of the busy area, you won't go too far wrong at this hotel. Please,tell Jan Egil to take a call home as soon is possible.He stay on KORONA HOTEL.Many Thanks. Hotel Korona is a very nice hotel when we got there we was greeted by staff who took are suitcases to are rooms for us. The staff are very polite and talkative, e.g the bar staff, cleaners (tried to teach me Bulgarian)and mainly the whole staff. The room was very clean and got cleaned everyday with clean towels and beds being made into fancy patterns. One problem i didnt like was the fact that there wasnt any phone boxes in the hotel or internet service to get in touch with family, and also the lifts didnt always seem to work. 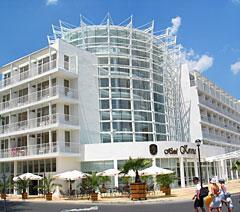 But i would reccomend hotel korona to anyone going to sunny beach, because it is a great atmosphere and lovely people. And i would also reccomend the restaurant across the road called rhodeo or something, great waiters // waitresess and amazing food, and very cheap. This is a fab Hotel. Great staff, clean rooms, beds made every day, clean towels every day, good food and great drinking tea!, great pool, 2 minutes walk from the beach. Only complaint is the lifts, a bit tempremental at times. A great base Hotel and great 24 hour security. Please leave the maids a tip as we did as they work really hard and are very polite. Obviously purchased more sunbeds as plenty there now (September). Staff friendly and rooms very spacious and clean. Central location. Would definately go back to Bulgaria and would request Korona for stay.